Blocker | Professional Use Only, No Warranty. With Sherwood’s factory in Strathroy, Ontario closing, it was inevitable for goalies like Martin Brodeur to make a switch in equipment brands next year. The mystery was to which brand? 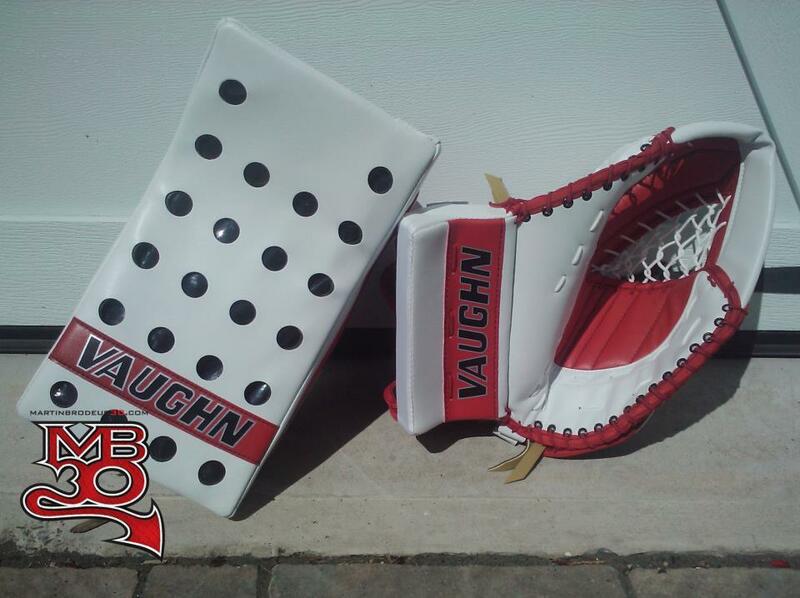 MartinBrodeur30.com recently unveiled Marty’s new Vaughns for this upcoming season. The blocker features a classic waffle board pattern and the glove looks to have an offset T pocket and angled two piece cuff. The pads share the same vintage look. They have the single break below the knee and angled inside boot. It will be interesting to see how much Sherwood product will still be in the NHL from this moment forward. It is very rare for Asian manufactured goaltending equipment to surface in the NHL so it’s only a matter of time before Sherwood’s other endorsed athlete, Craig Anderson, will make the switch to something else. The ever popular Sherwood 9950 foam core sticks will move production out of Canada as well. While many pros may still prefer foam core over composite, many companies do not offer it at the retail level anymore and Sherwood seems to be continuing this trend. Finally we’ve secured the funds to buy some goalie equipment and give the position a try. The only other time I’ve strapped on the pads was back in Bantam for a scrimmage. ProStockNation.com will serve as a mini-blog to document my transition from player to goaltender. When it comes to equipment, when Pro Stock is not available we still like to buy Canadian-made goods because the quality and craftsmanship is top notch; not to mention we enjoy supporting our local shops and manufacturers. I purchased the Brian’s DX2 Pro Blocker and DX5 Catcher with a Hackva 2608 Mask on order right now. 2/3 of the items are made in Canada which made it even more appealing to buy. What made the Brian’s set attractive was the fit and weight. Since Brian’s uses nothing but foams instead of plastic in their products, the end result is amazingly lightweight. The palm and gussets of the blocker are made with a mesh material for ultimate breathability and reinforced with a clarino overlay for durability. The catcher is nothing spectacular as it is an entry level model made off-shore (in Thailand specifically) so we’re not going to bother to show it just yet. The Hackva 2608 is currently on order and we will feature it as soon as it comes in. I decided to go with the Hackva because simply there was no better mask in the $400 range. They are the only company, not just in goalie equipment but for hockey in general, to offer a lifetime warranty on their product. The 2608 is hand assembled in Canada with with Kevlar, Fibreglass and a touch of Carbon. What initially got me interested in this mask were the amount of positive reviews and recommendations online. I drove down to my local shop to take a look and to try it on; I was very impressed with the fit and quality of the mask. It’s on par with it’s more expensive counterparts and at $400 it’s an absolute steal. We exchanged a few emails with Cindy Hackman of Hackva before we went down to our local dealer and have had very quick and informative replies from her. Check them out at www.Hackva.com. Our mask should be here in 1-1.5 weeks. I’ll post some pics when it comes in!